Life previous to the Khmer Rouge take over in 1975 was not good. Cambodia was entwined in the Vietnam War because of its proximity to the war zone. Cambodia shares a several hundred mile long border with Vietnam. Do you may remember Kent State riots and killings of university students in the US that was a turning point in opposition to the Vietnam war? Do you remember what they were protesting on that day? The secret bombing of Cambodia. Well, my wife grew up under those bombs. B-52’s carpet bombing Cambodia was a daily occurrence in the early 1970’s. One day Noit was visiting an uncle outside of Phnom Penh. She enjoyed running around the village and playing with her cousins. They didn’t really have toys, but they enjoyed playing with sticks, climbing trees and playing games with anything they could find. At noon, in the heat of the day, right after eating lunch with her relatives they all laid down to sleep. It was very hot, but on that day Noit walked over and shut the wooden shutters on the windows. Maybe she was trying to keep out the bright light, or maybe God sent his angels to guide her. As they were sleeping, suddenly were woken into a horrific fear. Massive explosions were shaking the house! A single B-52 can hold up to 100 bombs and some of those bombs could be as big as 2000 pounds. Each crater formed by the explosion is so large it could easily bury a house. In the midst of hundreds of explosions coming closer and closer a bomb exploded near the house. The shock wave blasted through her little body and Noit could hear the shrapnel ripping through the trees and house. As quickly as it came, the bombing was gone. Noit just hugged her cousins and uncles as they cried. They were all alive. Her little heart was beating so hard and the tears just kept flowing. When they went outside they could see the shrapnel from the bomb had peppered the entire wood house, but most of the burning hot metal shards did not penetrate the Cambodian hardwood. Because Noit has closed the heavy wood shutters everyone was safe inside from the burning shrapnel. It would not be long after that when the Khmer Rouge took over Phnom Penh. Noit was then 11 years old. She would be nearly 16 when she was freed. 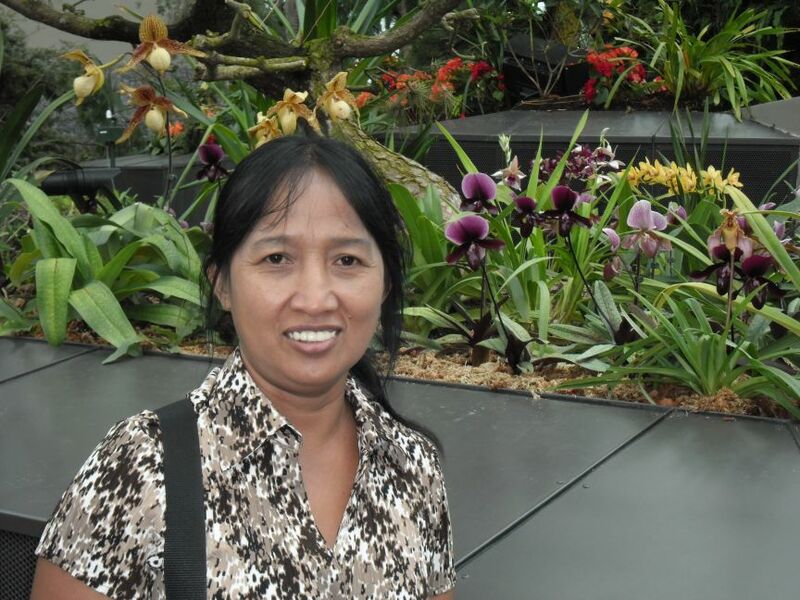 Upon returning to Phnom Penh her surviving sister found her a job as a police trainee. She made up a birthday showing herself to be 18 and was trained in police procedures, tactics and firearms. She was so afraid to hold a gun, knowing its deadly powers, that she only fired one bullet in all her years as a police officer, later leaving the force when she became a Christian, she had attained the rank of Major. Noit never had a childhood. She never had a doll. She never knew what it was like to be a restless teenager. She never had a pen pal or close friend, much less a prom to attend. She never went on a picnic with her family nor played in a swimming pool with her cousins. She was a slave of the Khmer Rouge and forced daily to work in construction projects with less than a spoonful of rice per day. Around her, one by one, she witnessed her cousins, grandparents, siblings and friends die of starvation and torture. Why did I bring my son, now only 13 years old, on a 150 mile walk? I want him to know his mother’s childhood. I want him to know that everything he has in life is a gift from God. I want him to know that his mommy works every day to make sure kids today can have a childhood. So they can hold a doll of their own, kick a soccer ball and laugh and play on playgrounds. So they can go to school and dream about what they want to be in the future. Children should have a childhood filled with love and happiness. Noit never had one, but each day she works to help hundreds of children to be able to experience what she never did. And as a result she is greatly loved and her name is known in Heaven! It is an honor to know her….. Thank you for sharing Noit’s story. Noit could enjoy a comfortable life as an adult now, but instead she chooses to sacrifically give and give and give of herself daily for the sake of others. Great will be her reward. However, people really can’t comprehend, since knowing Christ personally, how deeply Noit sacrifices ALL for the sake of pouring out God’s grace and mercy daily on others. love her! she is so special and such a testimony with her sweet heart and spirit. All that was stolen from Noit … She is reinstating for the next generation and I honour her for refusing to give up and for going on! A 7 fold pay back for all stolen from the children of Cambodia. God is the Restorer of all things lost! Amen!